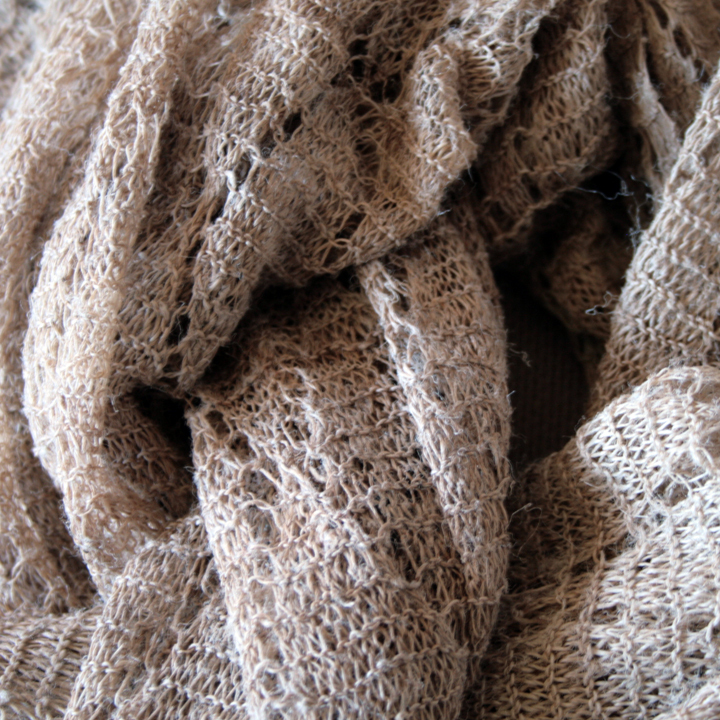 Hand knitted shawls made from the fibre of the giant Himalayan nettle. In the Himalayas of northern India, on the border between Tibet and Nepal, is Kumaon, one of the most beautiful and untouched areas of India. From there you can see the five snow-covered peaks of the Panchachuli mountain range. Panchachuli means “the five brothers” and is one of the highest mountain ranges in India. At the foot of the Panchachuli range is a cooperative of village women who use their traditional skills to produce beautiful products from high-quality raw materials. Panchachuli Women Weavers is a development program, which facilitates economic and social independence for women in the Indian Himalayas using the traditional arts of weaving and knitting. The project has given the women an alternative way of earning their living and has contributed significantly to the structural development of the Kumaon region. Over 800 women from a total of 32 villages in the region are involved in the processing of raw materials and the production of high-quality woven and knitted products. 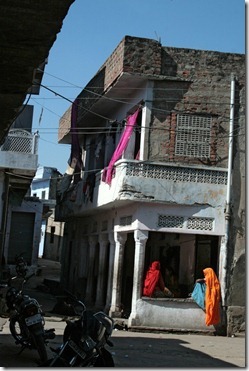 The women are all shareholders in the cooperative as well as receiving regular wages. A speciality of the Panchachuli women weavers is the treatment and processing of the giant nettles which grow in the Himalayan plateaus. The plant grows in large quantities in the region each year and is collected by the women in spring in the woods and fields. The nettle, known locally as allo, boasts the longest fibres in the plant kingdom producing exceptionally strong, hard-wearing but soft products. The processing of the nettle bark into yarn is a complicated process: the fibres are boiled, beaten to a pulp, bleached with chalk and then soaked. Then they have to be washed before they can be further processed to make the fine thread which is then knitted into these beautiful shawls. This entry was posted in KASU stock, The Makers and tagged giant nettle, handspun, Himalayas, India, Kamaon, knitted, women on November 16, 2014 by Beverley Bloxham. We are happy to announce that our gorgeous bags made from recycled tribal textiles have finally arrived! If you remember the 70s with a fondness for cheesecloth and embroidery, are an aging hippy, a nouveau hippy or just appreciate authentic tribal textiles: this is the real deal! The ladies of western Gujarat, India, have a long tradition of embellishing their clothes with fine stitchery and mirror work. After the costume is no longer usable, the textiles are still highly valued as they have taken years to create, so they are recycled into new creations like these great little bags we have in store. This entry was posted in Archived newsletters, KASU stock, News and tagged bags, embroidery, Gujarat, hand stitched, India, mirrorwork, recycled. upcycled, traditional, tribal textiles on February 4, 2014 by Beverley Bloxham. Our RetroGlam necklaces, made by moi, Beverley Bloxham, are made from no ordinary buttons and buckles. These babies have kept themselves nice down through the ages (well, from the mid 20th century), dodging the needle and thread, sidestepping cardies and coats, frocks and all manner of frippery to arrive clean and virginal in my button box. Maintaining their roots, they sport their vintage credentials in the pastel palette and strong geometric designs. This entry was posted in Archived newsletters, KASU stock, News, The Makers and tagged Australia, beads, buckles, buttons, glam, glass, handmade, mid 2oth century, necklaces, plastic, vintage on February 3, 2014 by Beverley Bloxham. This entry was posted in KASU stock, News, Organisations, The Makers and tagged Bagru, block printing, dabu, India, indigo, Jaipur, natural dyes, textiles, Village, wood block on June 21, 2013 by Beverley Bloxham. We have found some great tribal lost wax bronze castings made in the thousands of years old traditional way – some are recently made and some we purchased from a private collection of antiques. Known as Dhokra, this is an ancient craft that scholars believe to be at least 4500 years old. Artisans in the Indian states of Madhya Pradesh, Bihar, Orissa and West Bengal are still using this method to create jewelry, vessels, images of gods, goddesses, animals and birds and works from the imagination. Many are farmers who supplement their income in the summer months when the beeswax used to create the fine detail is supple and easy to work. This entry was posted in KASU stock, The Makers and tagged antique, Art, bees wax, Bihar, bronze, Clay, Crafts, Dhokra, India, KASU EMPORIUM, Lost-wax casting, Madhya Pradesh, West Bengal on June 17, 2013 by Beverley Bloxham. Winter has arrived in the southern hemisphere and we have some gorgeous warmth generating devices from one of the coldest places on the planet. It gets so cold in the Himalayas that even the goats have developed clever ways of keeping warm. 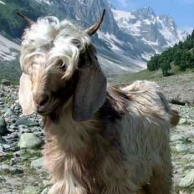 The Changthangi or pashmina goats have developed exceptionally warm and light fiber that not only insulates them from the sub-zero temperatures, but also makes some of the softest, warmest textiles you would ever want next to your skin. All these winter warmers are made from hand-spun fibre which has been dyed from natural sources* and hand-woven into the most beautiful cloth. This entry was posted in Archived newsletters, KASU stock, Organisations, The Makers and tagged Caesalpinia echinata, Cashmere goat, Changthangi, Dye, handspun, Himalayas, India, KASU EMPORIUM, luxurious, Natural dye, organic, soft, Textile, Uttarakhand, Weaving, wool on June 1, 2013 by Beverley Bloxham.